Indentification of this design as number 127 is original to Rakusan who designated this woodblock print as the 127th design published in his main sequence. However, 127 is actually the twenty-seventh of thirty-six woodblock prints in Rakusan's second main sequence series, 篁子生画選, Koushisei Gasen, lit. 'Koushisei's Print Selection' (usually called here the 36 Series). The woodblock print of 127 was adapted from an actual-size original painting on silk. All of the original prototype paintings for this series are currently in a single private collection. Like most 36 Series designs 127 has the same signature and seal combination on every copy. Therefore, for 127 only a single extended edition I (which includes reprintings both before and after World War II) can be distinguished. It is usually only possible to date an individual loose print of 127 with edition I markings by listing approximate potential ranges of 1935-1941 and 1948-1955. The copy illustrated above is typical of edition I. The Rakusan project which produced 篁子生画選, Koushisei Gasen, resulted in two related series of woodblock prints. Each print of the 36 Series is intimately connected to a group of prints with the same subjects in the Fan Series. Together these subject-related prints in the two series constitute a theme. Each theme typically consists of a quintet of monochrome Fan Series designs (one design in each of the five fan shapes), plus one polychrome, 36 Series design which illustrates the theme subject. The theme is labeled here by the original Rakusan number of its 36 Series design followed by the subject. 127 is the 36 Series design of the compound 127 Shrimp and Clam theme. The 127 Shrimp and Clam theme is one of the many entirely regular themes represented by a complete fan quintet and a color woodblock print. Three of the five Fan Series designs have seal C which indicates carving dates between the last months of 1933 and the end of the first quarter of 1934. Despite the early completion of those wooden blocks, Rakusan delayed printing and distribution for several months. The 127 Shrimp and Clam theme was eventually grouped with other winter season themes into an installment nearer to the end of the series. One fan design (127-3) has seal R which is a rare minor seal whose carving period has yet to be established. The 36 Series design 127 and the remaining fan design (127-5) both have seal B which indicates a later carving period closer to the time of publication. On the Fan Series delivery folio for installment eight in November 1934, Rakusan announced shrimp and clam designs as due to appear in installment nine in the following month, December 1934. However, it is not known if the installment nine was actually distributed in that month or was delayed. The woodblock prints would have been printed during the same month as their distribution. On the delivery documents Rakusan used the title 鰕に蛤, ebi ni hamaguri, loosely 'shrimp and clams', which is also the original title of the 36 Series design 127 published at the same time. The Japanese name 蝦, (also written 海老, 蛯, 螧, えび, エビ), ebi, is a general name for all lobsters, prawns, shrimp, and crayfish; but the meaning does not include crabs. There is no English name with equivalent scope. For convenience only, here 蝦, ebi, is translated as 'shrimp' because that is the historical meaning of that kanji, but its usage is actually more general. 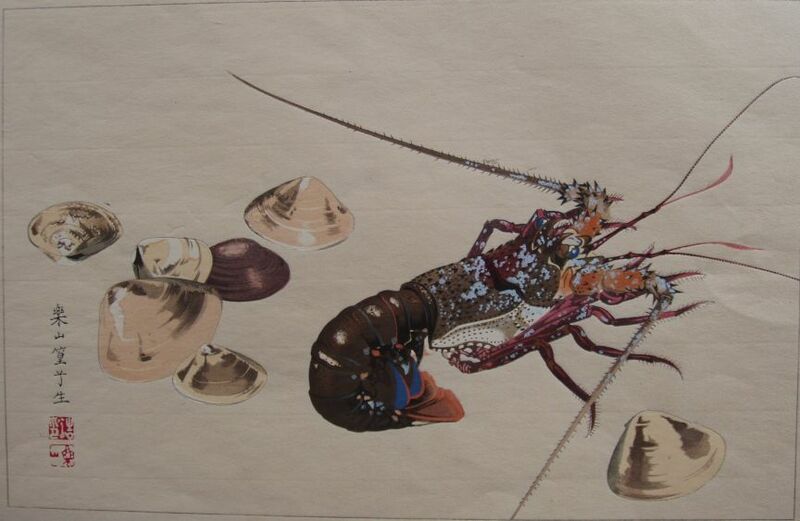 All of the animal life shown in the 127 Shrimp and Clam theme are sold in food markets. Rakusan could easily have obtained models in Kyoto and eaten them for dinner afterward. At least some of the clam designs in this theme could have been adapted from sketches originally created in the late 1920s during the planning of design 40 in the earlier 100 Series (see below). Japanese Spiny Lobster, Panulirus japonicus, 竜蝦, 伊勢海老, 伊勢蝦, 伊勢えび, いせえび, 伊勢エビ, いせエビ, イセエビ, ise-ebi, is a marine species native to Japan. 127 is the only known Rakusan design showing this species.